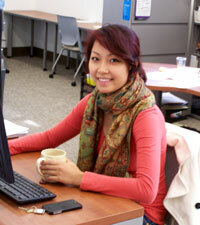 Minh Cao is this academic year’s Scholarly Outreach team graduate assistant. Minh, a native of Hanoi, Vietnam, earned a bachelor’s degree in Global Interdisciplinary Studies from Villanova University. She is enrolled in the Department of Communication graduate program. As the Outreach graduate assistant, Minh works with Darren Poley, Outreach librarian and team leader, and Gina Duffy, library events and program coordinator. Minh is interested in graphic design, photography, travel, arts and crafts, and languages.